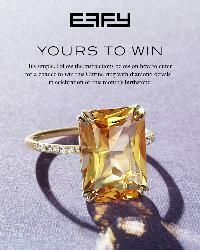 Prize: Yellow Gold Citrine and Diamond Ring. Approximate retail value (“ARV”) of prize: $995.00 USD. What you must do to enter: 1. Make sure you're following @EffyJewelry. 2. Like and share this post by 11/15/18. 3. Tag 3 of your friends in the comments. Statistics: This contest was opened by 90 and entered by 6 ContestChest.com members. 7% of those who opened the contest, entered it.